Sometimes the best places to visit are a little off the beaten path. Spots that call for plenty of photos and memories that last a lifetime. Wisconsin is not unfamiliar with the odd and bizarre, so if you’re looking to discover something that will really spark your curiosity, check out these 14 unusual attractions in the state. Located in Sister Bay, Al Johnson’s restaurant has goats grazing on the roof. 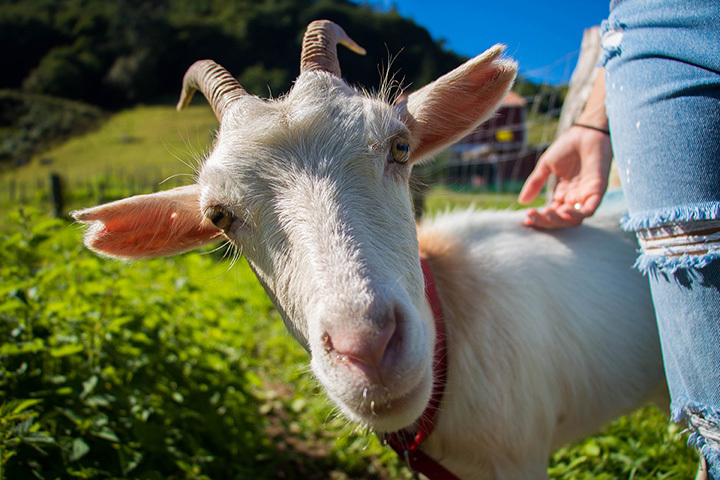 Catch an authentic Swiss meal but be sure to snap a picture or two of those crazy goats. The Sputnik Crash site is located in Manitowoc, Wisconsin, about 45 minutes south of Green Bay. While it’s only a small plaque located on a busy street it is still something iconic to check out if you are in the area. There’s a plaque in front of the art museum and a ring in the middle of the street for visitors to look at. Fred Smith’s Concrete Park is in Phillips, Wisconsin. What makes this park unique is that it is made entirely of concrete. Over 230 figures were created to describe his visionary of local culture. There are sculptures of animals, people, and iconic moments in American history. Creatures that are in the Jurustic Park are made from metal and steel. Throughout the years, rust has accumulated tainting the steel to a reddish color. There are all sorts of animals throughout the park near Marshfield, Wisconsin, and the kids will surely enjoy it. In the north woods of Woodruff, Wisconsin, lies the world’s largest penny. It all started out as local school children were trying to raise money to build a hospital in the area, the media picked up on the story and soon Woodruff had a donation of almost 1.7 million pennies from around the country to help. Their hospital was built and this penny was created as a memorial of the fundraising. Meet Pinkie the elephant—yes you heard that right, she has a name. This large pink elephant is located in DeForest, Wisconsin, near the Citgo. Great photos opportunities are in your near future since Pinkie wear goofy glasses and has a convenient curly trunk! In the late 1960s the Heileman Brewery built six very large and very tall storage tanks. Soon they were painted to look like cans of Heileman Old Style Lager Beer and voila the world’s largest six pack was cracked open. These big guys are in LaCrosse, Wisconsin. The entire store/ history museum is filled with over 5,500 jars of mustard. Admission is free and sampling is complimentary as well. Popular after the Netflix original series “Making a Murderer” staring Steve Avery, comes the Avery Salvage Yard located in Manitowoc County. This is a popular place for out of towners to stop or to take pictures outside of. And yes, the business is still up and running. In the Harley Davidson Museum, there is an iconic motorcycle called the Hog. Travel to Milwaukee to see this historically odd looking motorcycle from back in the day. Claire d-Loon is a large 2,000-pound loon located in Mercer, Wisconsin. She is around 16 feet in height and has a voice box that makes loon noises—how cool is that. Mercer, home of the World’s Largest Talking Loon. House on the Rock has a wide variety of attractions that make it a hot commodity in the area. One of the weirdest things is what’s inside of the attraction itself. There are a bunch of historic weird exhibits and collections of oddities. The House on the Rock holds the world’s largest indoor carousel and 200-foot sculpture of a whale fighting a giant squid just to name a few bizarre displays. Hotel Hell, previously known as Meribell Caves Hotel has historically been known as being haunted. Hotel Hell is located in Meribell, Wisconsin. The name itself, came from blood on the walls and loud yelling from the base of the hotel. Reports of the caves below the hotel have been said to be haunted as well. The Upside Down White House is located in Wisconsin Dells, Wisconsin. This place calls for goofy photo opportunities since everything is upside down. Just like the White House, you need a guide to take you throughout. Unlock secrets throughout this bizarre attraction in the Dells.